Week 35: Monsters U. I love Monsters Inc. so I'm super excited to take my kids to see Monsters U at the end of the month. There are only a few weeks left of school so I wanted to make this before my daughter is done. The Sully sandwich actually took more time than I thought, but most of it was figuring out the tint for the cream cheese. After trial and error, the trick is using a little bit of green mixed with blue. 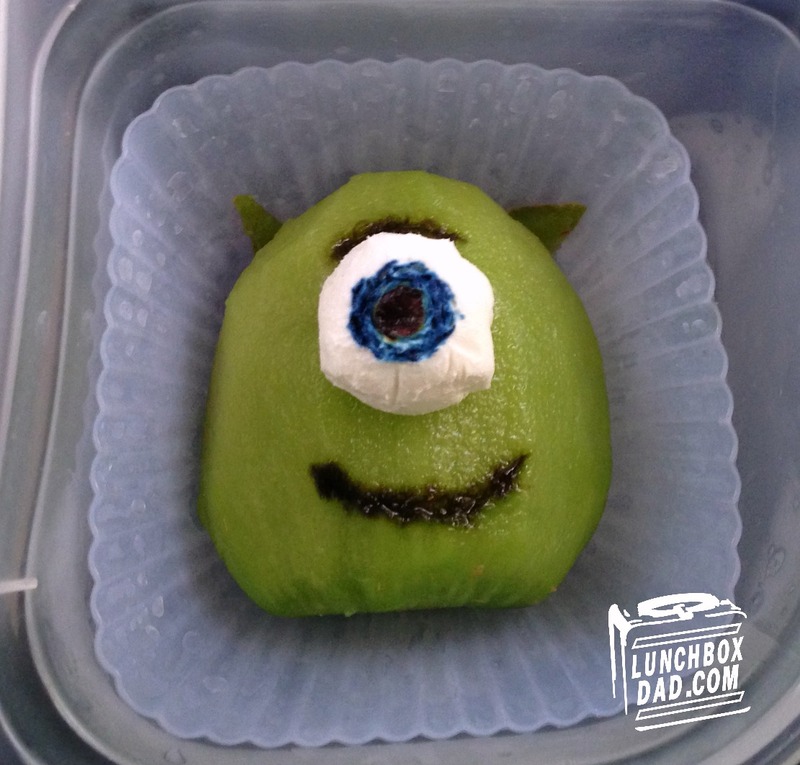 Mike Wazowski was actually really easy and if you are going to try one thing from this lunch, try him. I made this in an Easy Lunch Boxes container. Have fun with this lunch and lets hope the movie lives up to the hype! Cut two slices of bread into the shape of Sully's head. It is sort of pear shaped with horns on the side. Spread peanut butter, or similar spread that your child enjoys, on one slice. Press the other slice on top to make a sandwich. Cover most of his face with the blue tinted cream cheese, leaving his horns brown. Use two balls of cream cheese for his eyes and two small pieces for his teeth. Draw facial features with black food coloring (mix equal parts yellow, blue, and red). Use a toothpick to draw lines to make it look like fur. Finish with a blueberry for his nose. Place cheddar cheese for the background in your container and put the Sully sandwich in the middle. Drop a few blueberries around as accents. Skin a kiwi and cut it in half. Trim it slightly to be egg shaped like Mike's head. 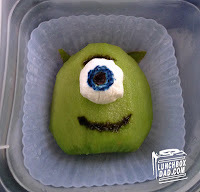 Use cream cheese for his eye and blue and black food coloring for the facial features. Place it in a side dish. Cut two small triangles from your scraps and place behind his head for ears. In a second side dish, fill with yogurt, apple sauce, or any other healthy food of that consistency that your child will eat. 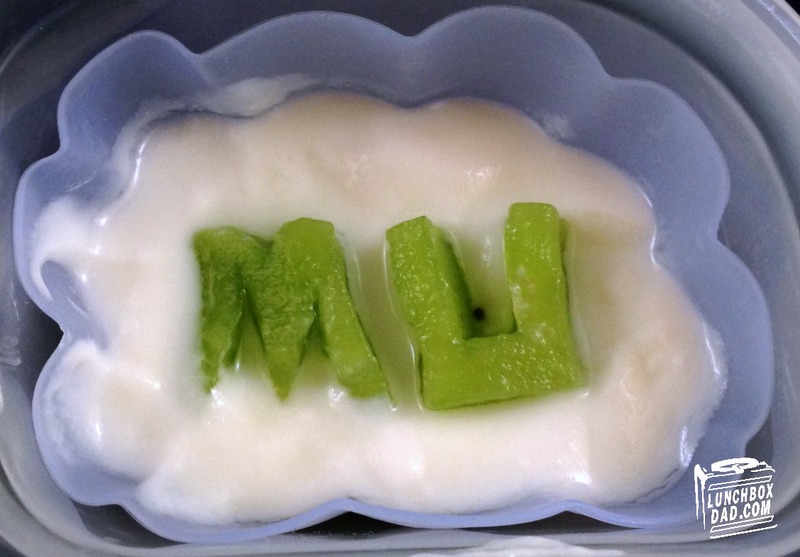 Cut the initials "MU" (for Monster's University) out of kiwi scraps. Place these on top of the yogurt. Thanks for checking out the blog and make sure and follow me on Facebook, Twitter, Pinterest and YouTube! This is amazing! 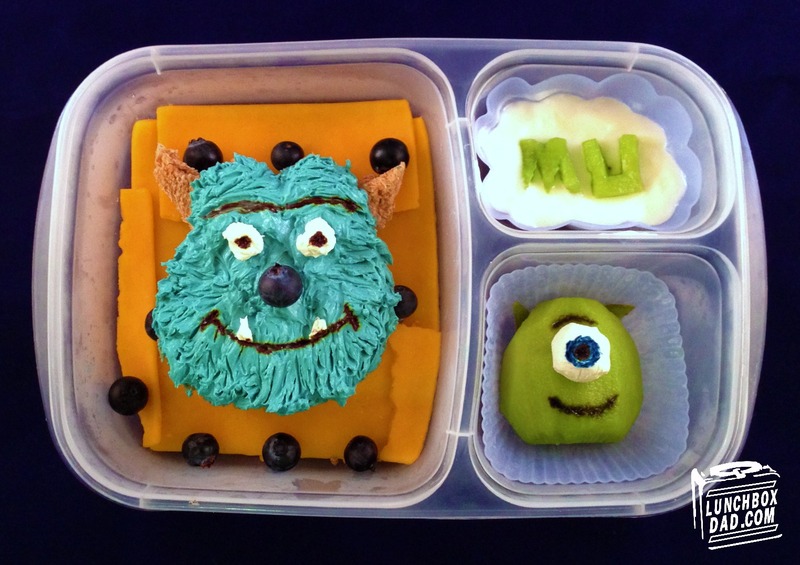 We can't wait to see Monsters U either! Thanks Jenn, I think the movie will be awesome! This is crazy awesome!!! I love all your details!